Leander Paes and Mahesh Bhupathi won the Chennai open for the fifth time as it marked a perfect reunion for the two great Indians. The pair prevailed over the young pair of Robin Haase and David Martin in a tense 3 setter. This was their 24th title together and something which all the Indian tennis fans have been waiting for. The Chennai open started disastrously for the Indian contingent as Somdev, Bopanna and Yuki all wild card entrants had lost in the first round in the singles. 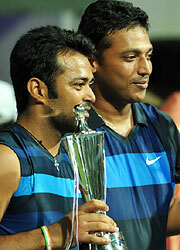 But the doubles title was really a sweet end to the tournament for the Chennai crowd. The great news is that Leander and Mahesh or Lee-Hesh as they are lovingly called by their fans have decided to play in the Australian open together in an attempt to win their 4th Grand Slam title together. It was yet another special win for the Indian pair and I hope they get few more before the end of the year. Congrats to Leander and Mahesh for an excellent victory. Elsewhere it was business as usual for the Champion Roger Federer as he defeated Nikolay Davydenko in straight sets to capture his 67th tour title at Doha this weekend. This was an ideal preparation for the champion for his defense of the Australian open later this month. Roger finished 2010 in style when he defeated Nadal in the London Masters final and has began the year 2011 brilliantly by capturing the Doha title. Robin Soderling was another winner this weekend at Brisbane, Australia as he defeated American Andy Roddick to claim his 7th tour title. This is a brilliant beginning for the Swede who ended the year 2010 at number 5 in the rankings. The win has enabled him to reach his career high ranking of No.4 again. He will try to put up a great show in the upcoming Australian open where he was ousted in the first round last year.